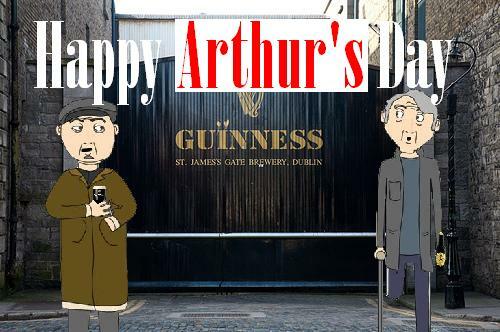 It’s that time again folks, today is Arthur’s day, one magical day to celebrate the Irish brewing legend Arthur Guinness and his world famous stout. Murphy’s fans will have to bite their tongues later as thousands of Guinness lovers will flock to the nearest pub after work to raise a pint in memory of the man, the drink and a trademark that has become synonymous with Ireland over the last 251 years. Tickets There, being fond lovers of the drink will shake off our now five day hangover to make it to McKenna’s pub in Dun Laoghaire where the proprietor, Arthur McKenna will retire after more than 50 years behind the counter. He is due to officially hand over running of the family pub to his oldest son, Arthur McKenna Junior (Arthur’s day or what!). The hustle and bustle of today will of course be concentrated around St. James Gate and the various other venues participating in Ireland as Diego, Guinness’ French owners put on a show to rival the St. Patrick’s day parade, hiring help from America, England, Wales and if they’re really stuck, Ireland itself but try not to forget the local pubs if you’re out tonight, the ones who sell you sweet, lovely Guinness everyday and need your business now more than ever. At 17:59 this evening, we’ll be raising our glasses to Arthur McKenna Senior, Arthur McKenna Jr. and off course, Arthur Guinness.